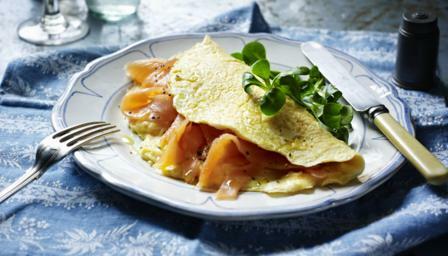 Raymond Blanc shows you how to make a perfect omelette with smoked salmon. Gently beat the eggs together in a mixing bowl and season, to taste, with salt and freshly ground black pepper. Heat the butter in an omelette pan until foaming. Pour in the beaten eggs and cook for a few seconds, until the bottom of the omelette is lightly set. Push the set parts of the omelette into the uncooked centre of the omelette. Cook again, until the omelette has set further, then push the set parts into the centre of the omelette again. Repeat the process until the eggs have just set but the omelette is still soft in the centre. Place two-thirds of the smoked salmon into the centre of the omelette and cook for 30 seconds. Remove from the heat and tilt the pan slightly to move the omelette to the edge of the pan. Slide the omelette onto a serving plate, then shape it into a neat roll. Brush the omelette with olive oil and serve.